We need the following for an upcoming webinar. Editable files have to be provided in .ai, .psd, .eps, .idd and .ppt formats. Event program: The program will open with an overview of the UBI Index Benchmark followed by an up-close and exclusive interview with Dhruv Bhatli, the author of “Top University Business Incubators – Global Benchmark 2013”. 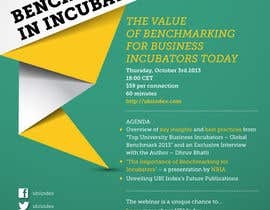 An expert will present after that about the value of benchmarking for incubators today. Towards the end, UBI Index team will unveil their future reports. This webinar is a unique chance for the audience to: get an overview of UBI Index learn about the UBI Index methodology through an exclusive interview with the Author, Dhruv Bhatli, and understand why it's important to benchmark incubators in a global basis. Event target group: Decision makers from university business incubators, tech transfer offices, government organizations etc. Partners: Snitts, Impulsa, Linköping University, ENPC School of International Management Paris, Chalmers School of Entrepreneurship. Logos are attached with the contest. Requirement: modern, fresh and visual. Please remember that [login to view URL] is a startup so our core values are young, fresh and dynamic but our target group is institutional. Which means we need something visual and fresh but respectful and professional. Look at #7 and let me know. Thanks for your participation and submissions. But we need something more modern and fresh. Plz. see the new attached .zip file. Can you produce something like that? We will discuss at let you know asap. Thank you. thanx for the invite but we dont take part of contests.